Having given us a staged version of Bach's St Matthew Passion in Manchester this year (see my review) Streetwise Opera are following this up with a season of events inspired by the music of Benjamin Britten. In 2017 the company will celebrate its 15th anniversary with a performance of new commissions from five composers in residence, who will write works inspired by Britten's Canticles. Then in 2018, the company will give the premiere of a new opera based on Britten's cabaret songs. 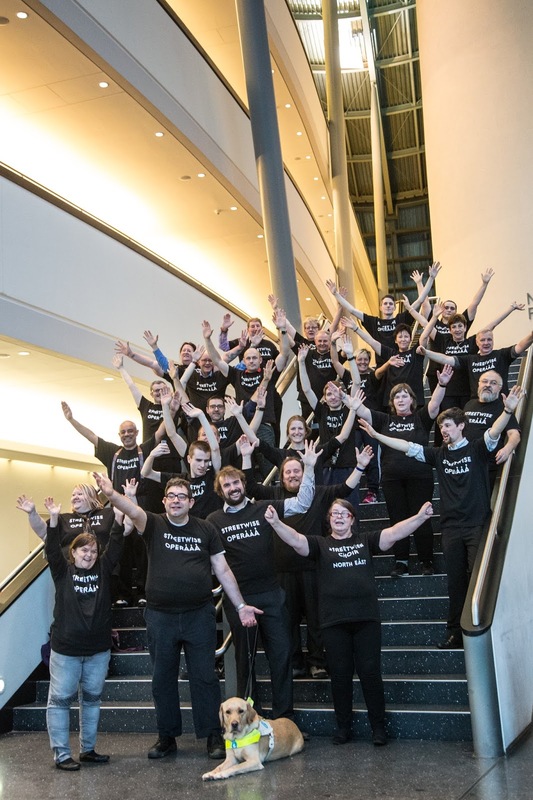 Streetwise Opera is a charity which produces music and musical theatre with performers who have experienced homelessness, using the music to help people make positive changes in their lives. It runs weekly workshops in London, Manchester, Middlesbrough, Nottingham and Newcastle/Gateshead. You can read more about them in my interview with Matt Peacock, the company's artistic director. Streetwise Opera's inaugural production in 2002 was Britten's Canticles so it is appropriate that they will celebrate their 15th anniversary with music inspired by these works. Each composer will collaborate with Streetwise Opera performers from one of its five regions to create a new chorus. Each chorus will be performed informally at local events early in 2017, and then will be performed together at the anniversary celebrations in London in Summer 2017. Anna Appleby will work in Manchester on a chorus based on Still falls the rain, Litha Efthymiou will work in London on a chorus based on My beloved is mine, Bushra El-Turk will work in Middlesbrough on a chorus inspired by Abraham and Isaac, Ella Jarman-Pinto will work in Newcastle/Gateshead on a chorus inspired by Journey of the Magi and Alex Patterson will work in Nottingham on a chorus inspired by The Death of St Narcissus. Then in 2018, in co-production with the Sage Gateshead and the Royal Northern Sinfonia, Streetwise Opera will present a new work featuring Britten's Cabaret Songs alongside a range of new commissions. The work will be performed at the Sage Gateshead by Streetwise Opera and the Royal Northern Sinfonia.